AwoX StriimLight review: Solid audio streaming—from your lamp?! Color-changing, Bluetooth-connected smart light bulbs have been one of the cooler—albeit largely unnecessary and novelty-minded—products of the smartphone era, with the Philips Hue leading the charge. AwoX has its own adjustable-light offerings, but the StriimLight isn’t that kind of bulb; it doesn’t even have its own app for controlling the device. However, it’s quite a bit more practical in the average home setting. The StriimLight is both an LED light and a Bluetooth speaker that hides behind your lampshade and is powered by the lamp itself. In other words, it’s a subtle and out-of-sight addition to any room that can be called upon in a moment’s notice. While not a spectacular speaker or the most versatile of lights, the pairing makes for a rather handy and unobtrusive device worth tucking away somewhere. Designed to be heard but not seen (the unit itself, at least), the StriimLight simply screws into any standard E26 light bulb base, and it’s meant to remain there, even when not in use. The unit draws power from the lamp’s own cord, just like a normal light bulb would, but your average everyday bulb isn’t going to sync with your smartphone or tablet and stream music at your command. Advantage: StriimLight. The remote lets you turn the light off even if the lamp is on. Granted, the StriimLight is much bulkier than a common light bulb, so it might not be perfectly compatible with your existing lampshade—the first one I tried was too snug and wouldn’t clamp back onto the lamp with the device installed. It was easy enough for me to leave the lampshade off at times during testing, but for everyday use, you may need to find a different lamp or shade if you’re set on having the device remain in your living space as intended. Due to the built-in speaker design, the StriimLight doesn’t illuminate from the solid white sides at all—just the translucent halo surrounding the speaker grate on the top. While the low-energy LED light itself is plenty bright, the amount of warm white light that spreads from such a minimal opening is rather limited in scale. In other words, it’s not likely to replace the primary bulb in any room, but it’ll suffice as a bonus bit of accent lighting. As an out-of-sight, always-handy Bluetooth speaker, however, AwoX’s device proves solidly capable. The StriimLight pairs easily with a tablet, smartphone, or computer over Bluetooth; simply turn on the light with your lamp’s normal switch and it’ll illuminate and automatically seek a device to pair with. Once paired, you’ll hear a handy ding from the speaker to confirm the handshake. And you can kill the light with the included plastic remote, which also has volume controls. If you’re seeking big sound to power your next party, or perhaps audio to fill a busy storefront or office, the StriimLight probably won’t fit the bill. It’s a tiny mono speaker that delivers just 10W of audio, so I wouldn’t recommend it for blasting dubstep at your next raucous gathering—as cool as wub-wubs coming out of your lamp might seem in theory. However, for listening to streaming radio or podcasts from your phone in a relatively quiet setting, it’ll absolutely do the trick. I streamed hours and hours of kid-friendly radio and various podcast episodes while watching my toddler, and while I usually rely on a Jambox for such needs, I appreciated not having to power up the StriimLight—and not being bombarded with obnoxious low-battery warnings. When testing with my paired iPhone, calls wouldn’t carry through to the StriimLight speaker, but that’s probably for the best: I’d like to continue resisting the urge to talk to my lamp. Compared to its more complex smart lighting contemporaries, the StriimLight comes off as somewhat mundane. It’s a simple lightbulb paired with a simple speaker, and that’s really it. 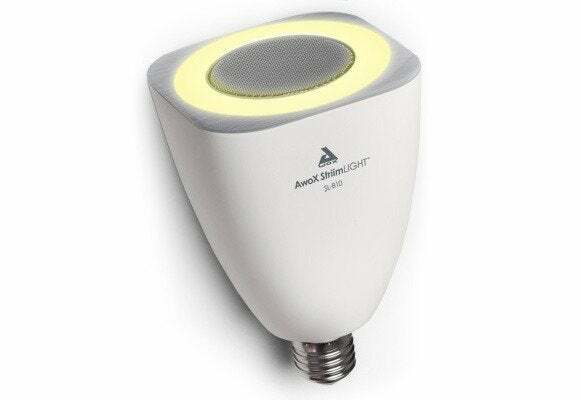 Even the other members of AwoX’s line have more enticing abilities, such as the StriimLight Wi-Fi, which lets you connect multiple bulbs over a wireless Internet connection and play music throughout your home. The standard StriimLight isn’t flashy, but it’s thankfully effective. Simplicity isn’t a weakness with the StriimLight, but rather a strength. The speaker is there when you need it, and when you don’t, it’s a light bulb. And if you don’t need either, the device hangs just out of sight, ready and waiting. It’s not the most versatile light bulb you can buy, certainly, and there are more powerful Bluetooth speakers at the $100 level. (You can find the StriimLight for $79 here.) But as an all-in-one option that blends well into nearly any living space, the StriimLight fits the bill. A solid light bulb and a decent Bluetooth speaker combine to form a pretty handy out-of-sight device. Easy to hide within a room. Solid sound quality for quiet settings. Can switch light off during playback. Won't work with all lampshades.